Thirty-three years ago, a dream kitchen makeover on their 100-year old house was just that, a dream for the future. Then, newlyweds, Michael and Diane were just thrilled to have found a great old house on the same street as Michael’s parents and sister in the neighborhood he grew up in. Everything else would come later. After 33 years, the kitchen was ready for a complete update. As the 3rd owners of the home, they moved into a house in near-original condition. So the kitchen, while not their dream kitchen, was given a functional update for the time being. Michael and Diane took on one room renovation at a time over the ensuing years. Diane was known to be in full demo mode pulling down plaster walls even while pregnant! They preserved the original wood trim details and replaced leaky windows. Over time the house came to be in good shape. But Diane—who loves to cook, bake and entertain still dreamed of one day having an open concept, entertainers’ kitchen. The kitchen was opened up to accommodate more people circulating throughout the space. After their three sons had grown and moved out (two sons moved into a downtown condo rental and the third left to study in the UK) it was time to start making the dream kitchen a reality. 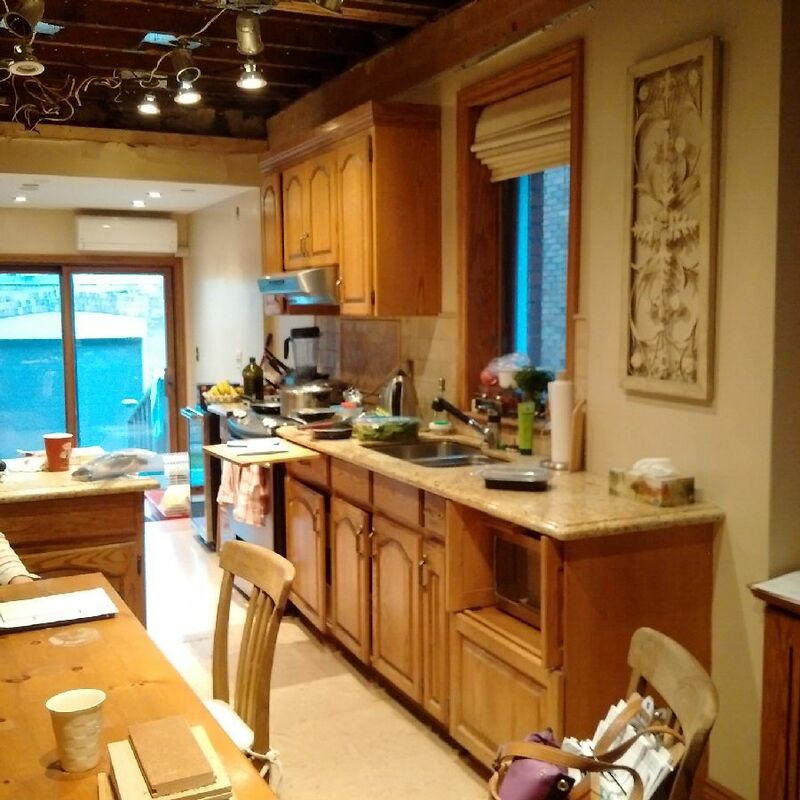 Working with our firm it was clear the couple knew what they wanted; walls down, false ceiling removed…and everything in the kitchen upgraded. A gut job. A new gas cooktop and integrated vent hood add a sleek, streamlined cooking zone. They wanted an island with seating in an open concept floor plan to allow guests and family to mingle by the kitchen. It was important for Diane to switch from electricity to gas for cooking and get all-new appliances. They preferred deep cabinets with under mount lighting, organized storage inside the pullout drawers and last but not least, a coffee station. Like a second window, the glass doors offer light coming from within. They cleared out their main floor and during the demo when the main wall was removed you could see the size of the gap between the old wood flooring and the kitchen. Patching it with newer flooring and staining it would not likely match up. The solution? All new wood floors throughout the main floor. 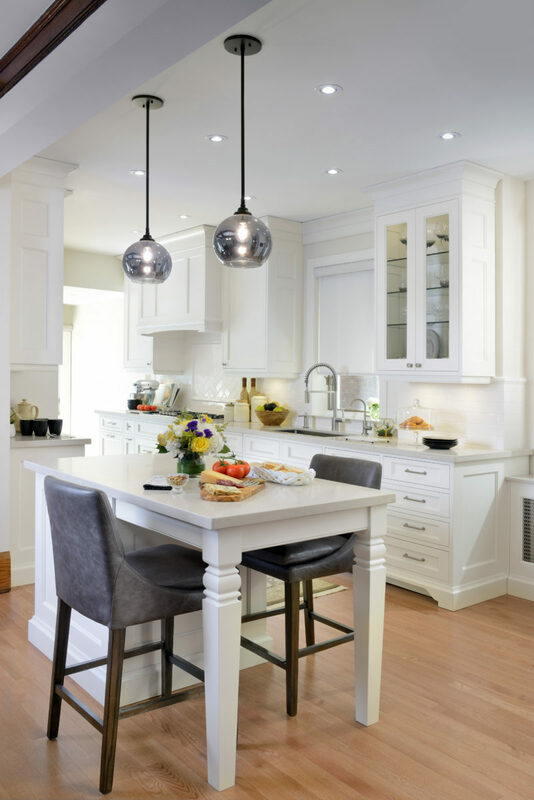 Three lighting settings are accessible in the undermount lighting with barely a tap. 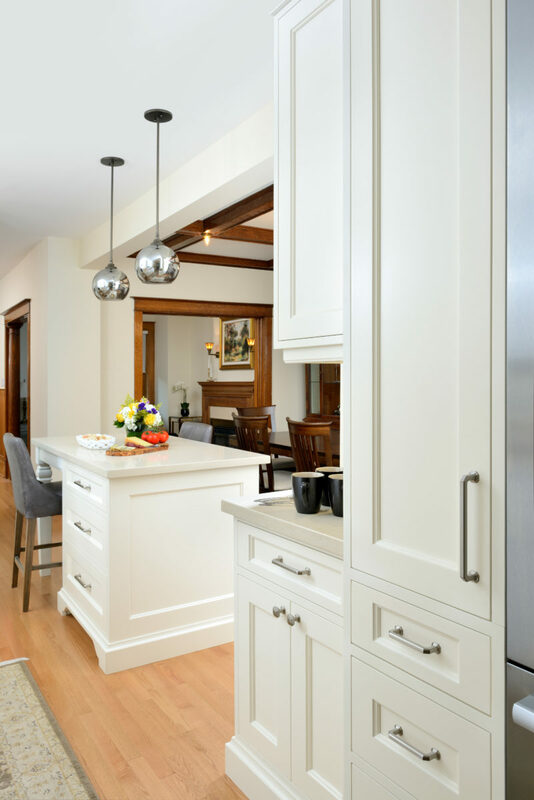 Custom designed cabinetry from Jane Lockhart Platinum completely transformed the room, almost instantly. Even the radiator cover is custom made to match the cabinets. Special under-mount lighting was installed and capped to hide any wires. 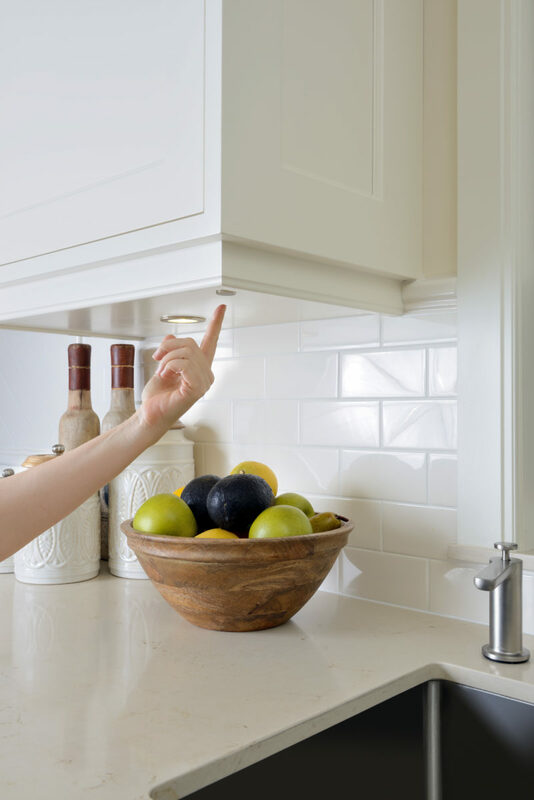 You can change the lighting to three different settings with barely a touch on a discreetly placed coin-sized button. 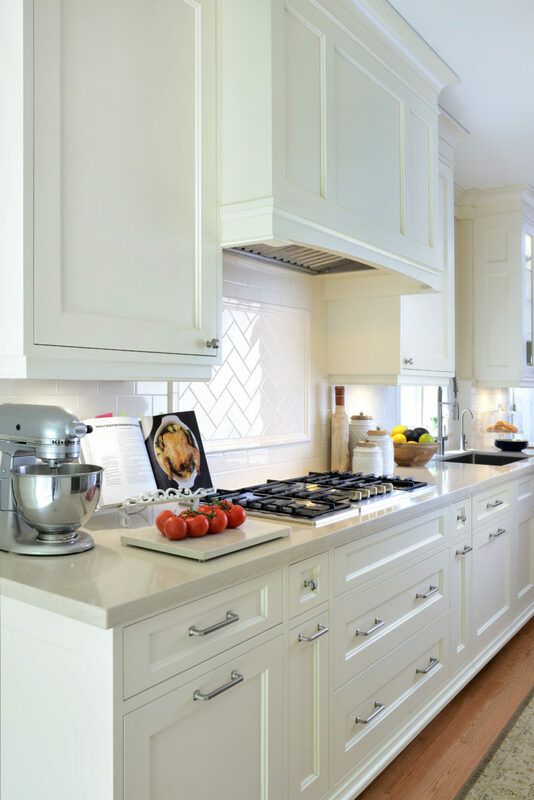 Custom cabinetry extends to radiator covers in Jane Lockhart’s Platinum kitchens. Coincidently, when the renovation was completed, all three boys moved back home! The condo owner wanted the rental unit for his own son and the third son’s UK studies were complete. Now the family is together again enjoying the kitchen to its fullest. This view shows the preserved original wood trim in the now open concept kitchen. Next up is planning eldest son’s wedding where they anticipate many evenings spent sitting around the island planning the occasion and the gatherings they’ll be hosting in their dream kitchen around the event. For Michael and Diane, home means family, and kitchens are the heart of the home. We were so happy to be part of making a dream come true. Is it time for your dream kitchen?